Many investigations on surgical methods and medical treatment are currently done on pigs. This is possible because the pig is sufficiently close genetically to humans. In recent years, progress in liver surgery has opened new possibilities in surgical treatment of liver diseases. Because the methods are relatively novel, various improvements are still needed, and it is thus helpful to conduct experimental surgeries on pig livers. We reviewed the literature to compare the anatomic and functional features of pig and human livers, information that will be of great importance for improving surgical techniques. During the literature review, we used various sources, such as PubMed, Scopus, and veterinary journals. Our results were summarized in diagrams to facilitate understanding of the vascular structure and biliary systems. We conclude that, although the shapes of the human and pig livers are quite different, the pig liver is divided into the same number of segments as the human liver, which also shows a common structure of the vascular system. Thus, with the anatomic and structural features of the pig liver taken into account, this animal model can be used in experimental hepatic surgery. Because of similarities in internal organ and cellular structures between pigs and humans, medical research is often performed on pigs.1,2 This similarity opens up great prospects in translational clinical studies that would otherwise be impossible to conduct in humans. For example, the porcine liver was successfully perfused as part of treatment for acute liver failure in a human patient, a condition that does not yet have a readily available cure.3 Similar studies have been conducted on pigs to improve methods for the control of computed tomography treatment zones after irreversible electroporation.4 In the study of Copca and associates, 26 pairs of pigs underwent liver transplant. The purpose of the study was to improve the surgical technique and tactics during liver transplant in humans.5 The most detailed description of the anatomy of the pig liver was presented in the works of Osman and associates, who described the anatomy of vessels, ducts, and lobes of the animal liver.2,6 Studies of the structure and function of the pig liver provide researchers with new possibilities for studying and developing novel surgical approaches to the treatment of liver diseases in humans. This review aimed to compare the vascular (venous and arterial) and biliary segmental anatomy of the porcine liver with the human liver based on review of the current literature. In addition, schematic illustrations of human and porcine liver (Figures 1-2-3-4) are presented to better understand and visualize the structure, the arterial vasculature, the portal vein, and venous drainage. Human liver receives its blood supply through the basin celiac artery, which is the common hepatic artery that originates from the celiac axis, along with the left gastric and splenic arteries. The common hepatic artery then branches into the proper hepatic artery and the gastroduodenal artery. The proper hepatic artery travels toward the liver and there divides into left and right hepatic arteries, feeding into the respective hepatic lobes. Blood supply for the pig liver is similar to that for the human liver. The total hepatic artery originates from the celiac trunk (Figure 2). Before it reaches the hilus of the liver, the hepatic artery divides into right and left branches (Figures 2, points 3 and 4). Generally, the branches of the hepatic artery in the different lobes of the liver follow the portal vein. The right hepatic branch divides into the ramus (R.) dexter lateralis (Figure 2, point 5) and R. dexter medialis (Figure 2, point 6); this division takes place at the area of connection between the right lateral and right medial lobes. Thus, there is a perfusion of the right lateral and right medial lobes, cor­responding to segments I, V, VI, VII, and VIII. The left hepatic branch originates from the latter at 2 to 3 cm from the porta hepatis. It is divided into 3 main branches: R. quadratus (Figure 2, point 7), R. lobi lateralis sinistri (Figure 2, point 9), and then continued as R. lobi medialis sinistri (Figure 2, point 8). It should be noted that the blood supply to the gall bladder comes from the R. quadratus. Thus, the left hepatic branch supplies blood to the left lateral, left medial, quadrate lobes, and gall bladder.6 Thereby, in our opinion, the pig’s liver, according to the arterial blood supply, can be divided into 2 arterial segments (right and left). It has been recently established that intraparenchymal hepatic arteries invariably follow the portal veins and supply the same segments. According to the above information, there is no significant difference in liver blood supply between pigs and humans. A minor difference is the later division of the pig artery in the right and left branches and also that blood supply to the gall bladder comes from the left hepatic artery pool. In humans, the portal vein is formed from the confluence of the superior mesenteric vein and splenic vein behind the neck of the pancreas. It divides into the left and right portal veins near the liver hilum (Figure 3a). The left portal vein has a longer extrahepatic course (Figure 3a, point 2). It gives off a branch to segment II before dividing into branches of segment III and segment IV. 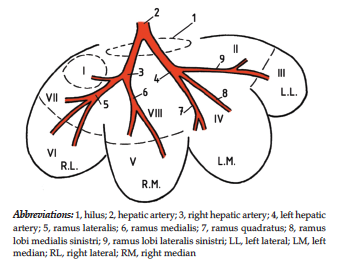 The right portal vein (Figure 3a, point 3) divides into anterior and posterior branches, corresponding to the segments V and VIII and VI and VII.15 Thus, the intrahepatic portal circulation anatomically divides the liver into the left and right lobe, with portal blood flow occurring according to the segments of the liver. The swine portal vein (Figure 3b) has the same configuration as the human vein. It has 2 main branches coming from the hilus of the liver between the hepatic artery dorsally and the bile duct ventrally, dividing at the hilum (close to the liver parenchyma) into the right and left portal trunk. Regarding the right portal trunk, it is worth noting that 80% is represented by 2 branches: the R. dorsalis dexter (Figure 3b, point 3) and R. ventralis dexter (Figure 3b, point 4). Only in 20% of cases does the right portal trunk extend from the portal vein itself and divide into the R. dorsalis and ventralis dexter close to the portal vein. Furthermore, the R. dorsalis dexter (Figure 3b, point 3) originates from the portal vein and proceeds within the parenchyma of the dorsal part of the right lateral lobe exactly between the latter and the caudate lobe. It divides into 4 main branches, as shown in Figure 3b (one being a caudate branch, which travels to the caudate lobe).6 Thus, the right dorsal branch supplies the right lateral and caudate lobes, which correspond to liver segment I, VI, and VII. Ramus ventralis dexter (Figure 3b, point 4) originates from the ventral aspect of the portal vein close to the origin of the right dorsal branch. It terminates by dividing into 2 branches distributed to the ventral portion of the right medial lobe.6 The right ventral branch supplies the right median lobe (Figure 3b) and corresponds to segments V and VIII. The left portal trunk (R. sinister) is a direct continuation of the portal vein (Figure 3b, point 5). It supplies the quadrate lobe and the left medial and left lateral lobes. According to the blood supply (lobes), 4 branches are formed.6 According to the literature, there are no communicating branches between the left medial and left lateral lobes. Therefore, the left portal trunk supplies liver segments II, III, and IV (Figure 3b). 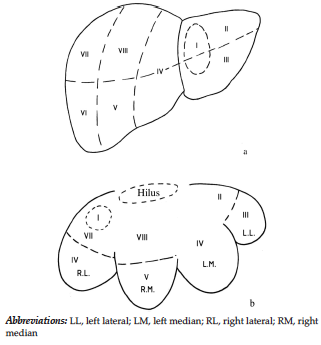 Therefore, in the pig liver (Figure 3b), the right portal trunk supplies blood to the right lateral and right median lobes, which correspond to liver segments I, VI, and VII. 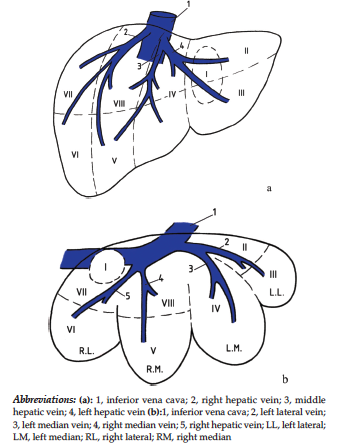 However, it is important to note that there is 1 or even 2 communicating branches of the portal vein (Figure 3b, point 6), which traverse the fissure between the right lateral and right median lobes of the liver.2 This knowledge is important because these branches are quite vulnerable and can be easily damaged during surgery. The left portal trunk (Figure 3b) supplies liver segments II, III, and IV, and there are no communicating branches between the left medial and left lateral lobes. Pig liver is divided, similarly to the human liver, into the portal segments according to the intrahepatic distribution of the portal vein, and there are no communicating branches between the left and right lobes. The right hepatic vein is the largest vein (Figure 4a, point 2) in both pig and human livers. It lies in the right fissure and serves segments V, VI, and VII and part of segment VIII. The left and middle hepatic veins may drain directly into the inferior vena cava but more commonly from a short common trunk before draining into the inferior vena cava. The middle hepatic vein lies in the median fissure and mainly serves the left liver together with the left hepatic vein, but it is partly supplied by segments VIII and V together with the right hepatic vein. Therefore, the middle hepatic vein supplies hepatic segments IV, V, and VIII. The left hepatic vein drains into segments IV(a), II, and III.19 Thus, the venous drainage is carried out through 3 major veins, but it is important to consider the presence of small veins (mainly in the right lobe of the liver) that also carry out the venous drainage of the inferior vena cava. Venous drainage in pig liver is carried out on a similar principle (Figure 3b). It is released through 4 hepatic veins, draining the left lateral, left medial, right medial, and right lateral lobes. The left lateral (Figure 3b, point 2) and left median (Figure 3b, point 3) veins often have a common confluence at the cava. The left lateral hepatic vein (Figure 3b, point 2) drains segment II and has a longer branch that drains segment III. The left median hepatic vein (Figure 3b, point 3) supplies segment IV. The right median hepatic vein supplies segments V and VIII (Figure 3b, point 4). Finally, the right hepatic vein drains segment VII and segment VI (Figure 3b, point 5). The human intrahepatic biliary tree is formed from the right and left hepatic ducts, which merge at the gate of the liver in the common bile duct. As a result of its confluence with the cystic duct, the common bile duct is created. The segmental distribution of the hepatic ducts follows that of the portal vein as they lie together within the Glissonian sheaths. Human biliary segmentation is identical to portal vein segmentation.19 Table 1 shows the division of biliary tree according to the segments of the human and pig liver. Again, as in the human liver, the segmental distribution of the pig hepatic duct follows that of the portal vein as they lie together within the Glissonian sheaths. The common bile duct is formed at the porta hepatis, ventral to the entrance of the portal vein, by the union of the cystic and the common hepatic ducts. The latter duct was formed by the confluence of the right and left hepatic ducts. The left hepatic duct generally has a much larger caliber than the right and drains the left median, left lateral, and quadrate lobes. It is formed by the convergence of 2 branches: R. lobi lateralis sinistri and R. lobi medialis sinistri. The right hepatic duct is formed ventrally to the initial part of the portal vein by the confluence of the R. processes caudatus, R. dorsalis, R. intermedius, and R. ventralis lobi lateralis dextri. The right segment receives the bile from the caudate process and right lateral and right medial lobes.2,6 Therefore, the swine liver could be divided into 2 biliary segments: the right and left, draining the right and left hepatic ducts. The distribution of the segments is shown in Table 1. Concerning the arterial vasculature, the present investigation did not reveal any specific differences between human and porcine liver. As indicated by others, the intraparenchymal hepatic arteries invariably follow the portal veins and supply the same segments. A distinctive feature of the venous drainage of the pig liver is that the inferior vena cava and the hepatic vein confluence is intraparenchymal, with segment I draining directly into the inferior vena cava, and the veins having thin walls. Because of this structure, liver veins may be easily damaged during a surgical procedure. Due to the location of the intrapa­renchymal inferior vena cava, resection of the right lateral lobe is difficult. Regarding the biliary tree, like in the human liver, the segmental distribution of the hepatic ducts follows that of the portal vein as they lie together within the Glissonian sheaths. It is necessary to consider that, because of its specific location, the right posterior duct can be easily damaged during dissection and ligation of the left and middle branches of the portal vein. These facts give rise to an important conclusion that any clinically significant differences in the structure, morphology, and circulatory systems between pig and human livers were not revealed. Therefore, when the special features of the pig liver are taken into consideration, it can be used in experimental surgery for the purpose of developing and improving methods such as single or multistage hepatectomy, liver transplant, certain steps of endovascular embolization, and radiofrequency ablation. Ladurner R, Hochleitner B, Schneeberger S, et al. Extended liver resection and hepatic ischemia in pigs: a new, potentially reversible model to induce acute liver failure and study artificial liver support systems. Eur Surg Res. 2005;37(6):365-369. Court FG, Wemyss-Holden SA, Morrison CP, et al. Segmental nature of the porcine liver and its potential as a model for experimental partial hepatectomy. Br J Surg. 2003;90(4):440-444. Lempinen M, Collan Y, Sivula A, et al. Extracorporeal pig-liver perfusion in a patient with acute hepatic failure. Scand J Gastroenterol. 1971;6(5):377-383. Dong J, Zhang L, Li W, et al. 1.0 T open-configuration magnetic resonance-guided microwave ablation of pig livers in real time. Sci Rep. 2015;5:13551. Copca N, Hanna A, Pivniceru C, et al. Experimental liver transplantation on pigs–technical considerations. Chirurgia (Bucur). 2013;108(4):542-546. Osman FA, Wally YR, El-Nady FA, Rezk HM. Gross anatomical studies on the portal vein, hepatic artery and bile duct in the liver of the pig. J Vet Anat. 2008;1(1):59-72. Heinemann A, Wischhusen F, Püschel K, Rogiers X. Standard liver volume in the Caucasian population. Liver Transpl Surg. 1999;5(5):366-368. Eiriksson K. Technical Aspects of Laparoscopic Liver Resection. An Experimental Study [Elektronisk resurs]. Uppsala, Sweden: Acta Universitatis Upsaliensis; 2012. http://uu.diva-portal.org/smash/get/diva2: 512252/FULLTEXT01.pdf. Madhan KE, Raju S. Comparative histology of human and cow, goat and sheep liver. J Surg Acad. 2014;4(1):10-13. Bismuth H. Surgical anatomy and anatomical surgery of the liver. World J Surg. 1982;6(1):3-9. Couinaud C. [Liver lobes and segments: notes on the anatomical architecture and surgery of the liver ]. Presse Med. 1954;62(33):709-712. Kahn D, Hickman R, Terblanche J, von Sommoggy S. Partial hepatectomy and liver regeneration in pigs–the response to different resection sizes. J Surg Res. 1988;45(2):176-180. Sebben GA, Rocha SL, Sebben MA, Parussolo Filho PR, Gonçalves BH. [Variations of hepatic artery: anatomical study on cadavers.] Rev Col Bras Cir. 2013;40(3):221-226. Nikonenko AA. [Occlusive stenosis of unpaired visceral branches--diagnosis and treatment.] Klin Khir. 2013;(12):33-36. Koç Z, Oðuzkurt L, Ulusan S. Portal vein variations: clinical implications and frequencies in routine abdominal multidetector CT. Diagn Interv Radiol. 2007;13(2):75-80. Wang PJ, Li WC, Xi GM, et al. Biomechanical study of hepatic portal vein in humans and pigs and its value in liver transplantation. Transplant Proc. 2009 Jun;41(5):1906-1910. Zhang Y, Huang T, Wang P, Li W, Yu M. Comparison of morphology and microstructural components of hepatic portal vein between human and pig. J Huazhong Univ Sci Technolog Med Sci. 2005;25(4):419-422. 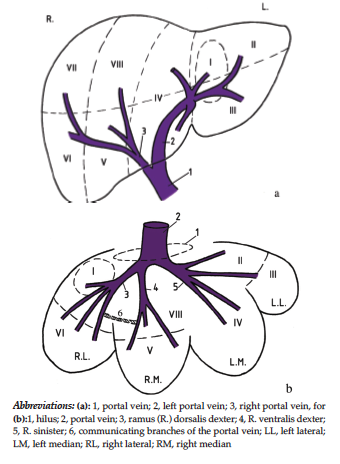 Nakamura S, Tsuzuki T. Surgical anatomy of the hepatic veins and the inferior vena cava. Surg Gynecol Obstet. 1981;152(1):43-50. Skandalakis JE, Skandalakis LJ, Skandalakis PN, Mirilas P. Hepatic surgical anatomy. Surg Clin North Am. 2004 Apr;84(2):413-435. Ghoshal NG, Koch T, Popesko P. The Venous Drainage of the Domestic Animals. Philadelphia, PA: WB Saunders; 1981. Acknowledgements: This work was supported by projects IRP201549.